In my last post, I looked at the Conrail Union Branch, which forms the western limit of the DTRR on the map at the left. After traveling north from Dearborn, the right-of-way turns east and terminates before reaching the kink where the tracks turn slightly northeast. Before the original DTRR was abandoned, this "kink" is where the west end of the DTRR interchanged with the Pennsylvania Railroad's Union Branch, and the latter railroad ended. The DTRR continued northeast through Highland Park, turned briefly eastward, and then south to the the Grand Trunk Western's North Yard. Conrail tore up the entire northeasterly section between the Union Branch and what is now called the Highland Park Industrial Track. 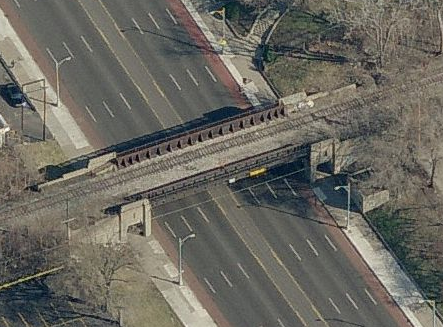 Here's a closer view from Google satellite imagery, showing what remains of the Highland Park Industrial Track. In our tour of the line, we'll start just north of Conrail's North Yard, at a complex junction called CP Bonita. In the image from Bing Maps Bird's Eye view to the left, we are looking eastward at CP Bonita, with the northern tip of Conrail North Yard at the left edge of the picture. 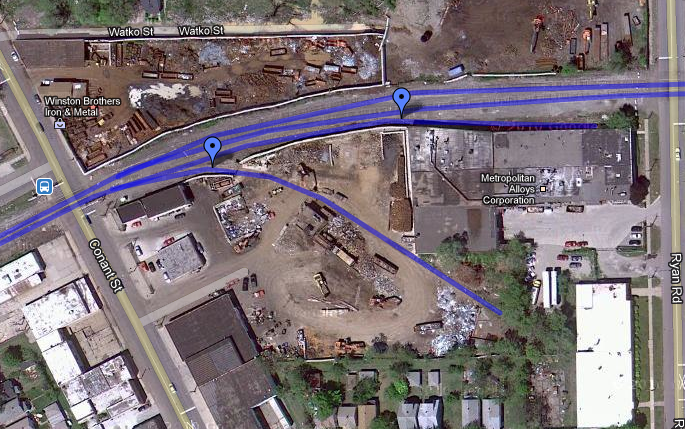 The double-tracks running due north are the Conrail North Yard Branch/Sterling Secondary. The Highland Park Industrial Track diverges northwest from the North Yard Branch, curving out of the top right corner of this photo. You may also be able to see another track diverging southeast from the North Yard Branch trackage, which is the Detroit Terminal East Industrial Track. 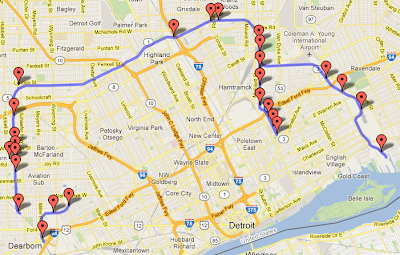 More on the latter in another post, but at one time the Highland Park and Detroit Terminal East industrial tracks weren't separate branches, but the continuous main line of the Detroit Terminal Railroad's East End. 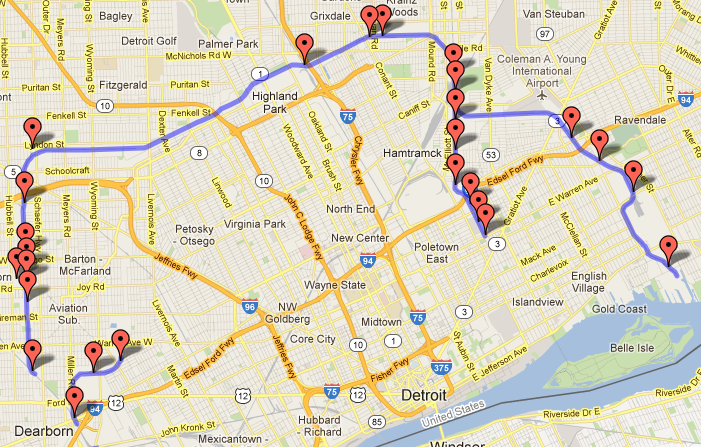 The DTRR crossed the Michigan Central and Grand Trunk Western tracks, and a large volume of traffic was interchanged between DTRR's Davison Yard and both the Michigan Central North Yard and Grand Trunk Western East Yard. The latter two yards were nearly indistinguishable; appearing instead to be one humongous yard smack dab in the middle of the Hamtramck neighborhood. This is the Mound Correctional Facility, which stands on the site of the former DTRR Davison yard. This was the main classification yard of the DTRR, taking in rail traffic from both of its parent railroads - the Michigan Central and Grand Trunk Western - and routing cars all over Detroit. There was a roundhouse here, left over from the days of steam, as well as the DTRR's main offices. It had become dilapidated in its final days, with several stalls open to the elements after a fire. The yard lead crossed a tangle of roads on the eastern edge of the yard, including Davison Street (from which the yard got its name) and Mound Road, which I'm sure caused many a traffic snarl! 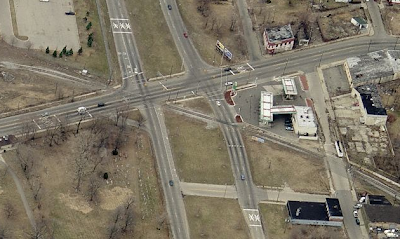 This is the same intersection today, but trains pass by infrequently and without much notice. Just across the tracks from the Mound Correctional Facility is Alpha Resins, which features an interesting track layout. Consider that any train switching this industry (and the others nearby) will come from North Yard, traveling from right to left in this picture, with the locomotive in the lead. While Alpha Resins' spur off the main track looks like a simple trailing point affair, if the engineer simple backs the train into the spur, his locomotive is now in the way for the switchback into the plant itself. To deliver cars to the customer, the crew must use the Jailhouse siding to run around the train and lead the train into the spur engine-first. Then the crew can back the cars into the appropriate spots among the three spurs within the plant. If that's not enough, consider that the crew will likely need to pull cars out of the plant before delivering new ones, and you've got a lot of work to do! Here's another view, using Bing Maps' Birds Eye view, from the trackside. I count at least three places to spot cars: first, at the left-most set of tanks; second, at the larger group of white tanks near the top right corner of this image; third, at the small group of rusty-looking tanks near the bottom of the photo. In addition, it looks like additional cars could be stored (or possibly spotted) along the spur that runs in front of the tall building near the bottom right corner of the photo. Lastly, the roll-up doors in the long, low building on the left side of the photo could be car spots too. All in all, there's a lot going on here; Alpha Resins is definitely a high priority to model on the DTRR. Across Ryan Road, just east of Alpha Resins, is another interesting set of industries. First is Metropolitan Alloys Corporation, which produces zinc alloys and aluminum products. 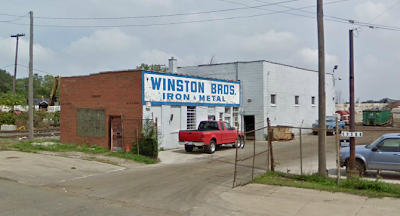 Right next door is Winston Brothers Iron & Metal, one of many scrap metal recyclers in Detroit. I wasn't entirely certain that Metropolitan Alloys was still rail-served, but then I stumbled upon the image at left using Bing Maps. Sure enough, that's a 50' boxcar spotted at one of the building's roll-up doors. Here's Winston Brothers Iron & Metal from roughly the same perspective. It's hard to see in this view, but you can just make out the spur curving to the southeast among the rusting hulks and cranes. You may also be able to see two empty gondolas sitting on the Metropolitan Alloys spur, waiting to be spotted in the Winston Brothers yard for loading. I dig the sign painted on the building and the battered chain link fence. Even if it weren't for the fact that scrap metal is a key industry in Detroit, I'd include this scene in my model of the DTRR for sheer character. 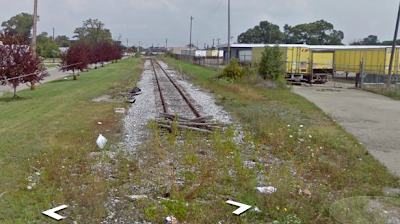 Google sayeth the track endeth here, though Bing disagrees, and shows satellite imagery of the DTRR tracks continuing all the way to Ford Junction, where the Detroit Terminal crossed the CN (GTW) Holly Subdivision. Both the DTRR and one of its parents, the GTW, served the large Ford Highland Park plant here. It was here that the first assembly line was used for mass production of the famous Model T automobile. Most of the plant is now shut down. 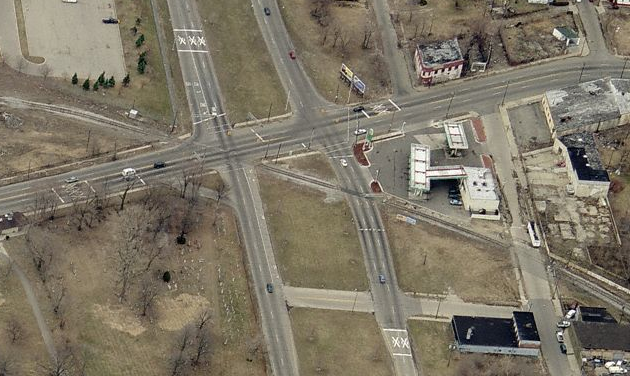 The last point of interest is the DTRR overpass over Woodward Avenue. Woodward was the main road from downtown Detroit to Pontiac, MI, and every year the Woodward Dream Cruise is held along its entire length. Classic American cars of nearly every description cruise continuously, while scores more park in every parking lot, driveway and sidewalk along the route. Though not a priority, given the space, I'd try to model this craziness in 1:87 just for kicks. Plus, I think the bridge looks pretty neat. In my next post, I'll take a look at the Detroit Terminal East Industrial Track, mentioned near the beginning of this post. As always, thanks for reading. Born in Blighty, raised in NASCAR country, Ohio State graduate and recent immigrant to Chicagoland. Former Metro Detroit resident and fan of the Detroit Terminal Railroad.